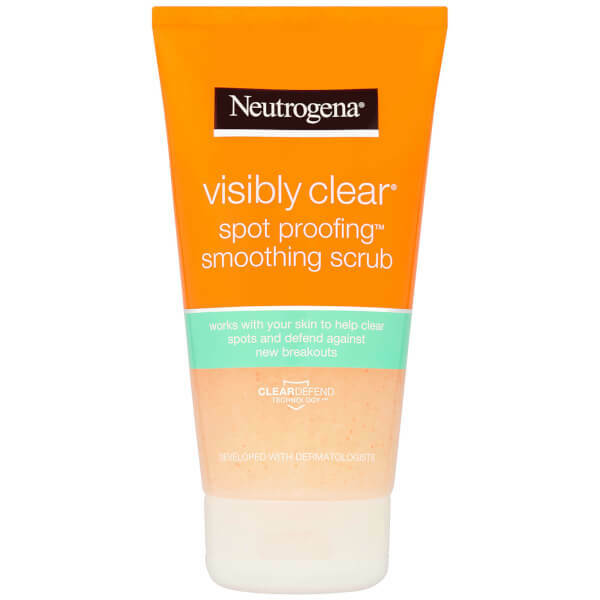 Polish and perfect the complexion with the Neutrogena Visibly Clear Spot Proofing Smoothing Scrub; a gentle yet effective exfoliator that helps to clear spots, as well as protect the visage from future breakouts. Utilising Neutrogena’s ClearDefend Technology™, the intelligent formula comfortably massages over the complexion, sloughing away dead skin cells and clearing congested pores. The smoothing scrub guarantees not to strip skin of essential moisture, oils or nutrients, which helps to boost its natural shield of protection against breakouts. Enhancing skin’s natural renewal process, the scrub leaves skin feeling touchably soft and enviably smooth. Expect healthy-looking, spot-proof skin. Use once a day. Wet face. Apply to hands, add water and massage face gently. Rinse thoroughly. For best results, follow with Neutrogena® Visibly Clear® Oil free moisturiser. [PR-017564], Aqua, Sodium C14-16 Olefin Sulfonate, Cocamidopropyl Hydroxysultaine, Sorbitol, Cellulose, Salicylic Acid, Sodium Hydrolyzed Potato Starch Dodecenylsuccinate, Acrylates Crosspolymer-4, C12-15 Alkyl Lactate, Lactic Acid, Panthenol, Cocamidopropyl PG-Dimonium Chloride Phosphate, Talc, Cera Microcristallina, Sodium Chloride, Disodium EDTA, Citric Acid, Sodium Hydroxide, Benzalkonium Chloride, Parfum, CI 19140, CI 73360.